TapSnap has captured hundreds of touching moments for children this holiday season, and given them some priceless photos. TapSnap was the official Santa photographer at the Deaf Children’s Society of BC Christmas party, taking pictures of all the children they support. TapSnap used its green screen capabilities to digitally insert a North Pole background into the pictures. The result was absolutely magical. In New Orleans, TapSnap 1015’s Jose Areizaga took TapSnap to the Casa Jefferson children’s party. “For the children, some of whom are in foster care and don’t get to see their parents that often, it was wonderful for them to have a holiday keepsake photo with their mom or dad that they could take home,” says Jose. The Casa in Casa Jefferson stands for Court Appointed Special Advocates, and this non-profit organization advocates on behalf of abused and neglected children in New Orleans. The event was generously paid for by a group of New Orleans Saints players. 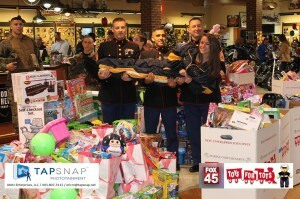 In Baltimore, Md., TapSnap 1020 collaborated with Fox 45 TV at the Toys for Tots kick-off, which started at 5am at the local Harley Davidson store and went until 10pm. Every year across the country, the Marines Corp runs an annual toy drive, collecting unwrapped toys for children. People who dropped off toys had a chance to experience TapSnap, take a photo of themselves and share it with the world on social media. The kind that makes great memories, which is what TapSnap is all about.